Well, friends, we have come to the end of our class called "Running the Race of Faith" at Patterson Park Church this fall. Some of you have joined us and followed along. Since we have taken some detours along the way at "A Branch in the Vine," click here for Part 1. Now enjoy the remainder...and keep on running! 4. My success in running depends on my focus. See Lessons from a Family Vacation: We become like what we focus on. Glory and grace when we focus on HIM! 5. Submission to my “Coach’s” training program is key. He disciplines us for our good, so that we may share His holiness. All discipline for the moment seems not to be joyful, but sorrowful; yet to those who have been trained by it, afterwards it yields the peaceful fruit of righteousness. 6. I must be a “team participant”. It's so easy to get bitter over life's hardships and the "irregular people" in our lives...even "irregular Christian people." Yes, there are fellow teammates who just don't get it...actually we may be one of those at times, huh? I love this quote by Henri Nouwen entitled, "Stepping Over Our Wounds." Sometimes we have to "step over" our anger, our jealousy, or our feelings of rejection and move on [a.k.a. run on]. The temptation is to get stuck in our negative emotions, poking around in them as if we belong there. Then we become the "offended one," "the forgotten one," or "the discarded one." Yes, we can get attached to these negative identities and even take morbid pleasure in them. It might be good to have a look at these dark feelings and explore where they come from, but there comes a moment to step over them, leave them behind and travel on [a.k.a. run on]. Bread for the Journey, Henri Nouwen. It's a precious relationship...but why is it so hard...and painful? We keep "missing" each other! Maybe we don't "get" each other? I keep trying to respect boundaries and be "circumspect" in what I say and do...and then it comes: stuff from the past, mistakes in the present...at times, I am responsible...other times, I feel like I'm damned if I do, damned if I don't. Not the sweetness and light I keep hoping for! Lord, why? Why is it so hard? How do I navigate this relationship? 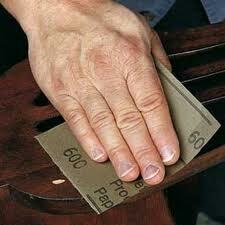 This relationship is Sandpaper in My Hands to shine you up...to get those rough places smooth! Now how can I argue with that? Thank you, Lord! Many of you are going through difficulties of every kind...excruciating, even life threatening health problems, mental and emotional heartache, relational stresses, and the list goes on. We have no idea what the Father is doing in His sovereignty. But one thing we can count on is that He is shining us up more and more to look like His glorious Son Who indwells us. So let's embrace Him and our life and believe with all our hearts that nothing is wasted in His almighty, loving Fatherly Hands. You might also like to look at "In Pain...two Things I Know"
God calls us to own our lives...to hug them to our breasts and to live them with all our hearts! No place do we see this truth more clearly than in the letter to the Hebrews, chapter 12. ...our turn to run our lap in the race of faith! 1. I’m part of something bigger than myself. See the Hebrews 11 blog to meditate on this truth. 2. There are hindrances to my running. See Caught in the Web. 3. My lap is uniquely mine. I am the true Vine, and My Father is the Vinedresser. Every branch in Me...that bears fruit, He prunes it, that it may bear more fruit. John 15:1,2 From what I understand, important to the process of growing grapes is pruning the vine. Now I am definitely not a gardener! So if I have ever pruned anything, I've done a very wimpy job of it. 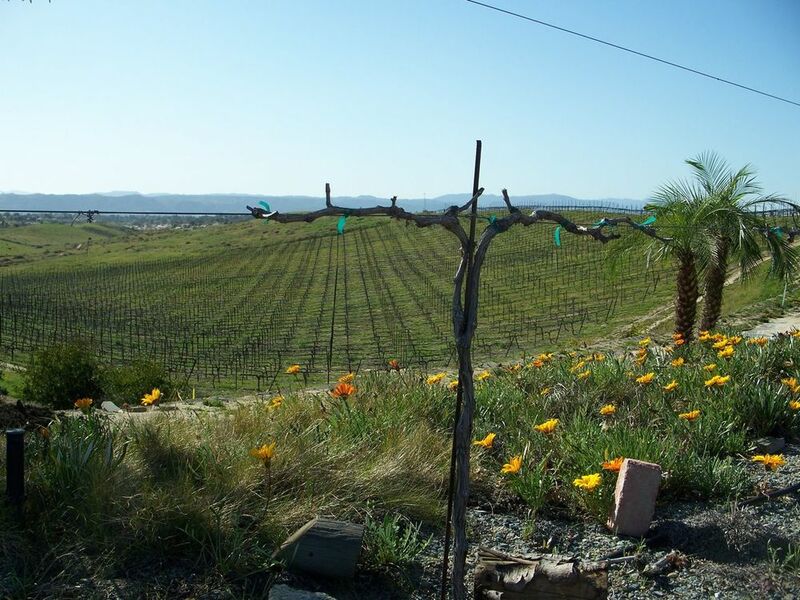 I was shocked a few years ago when we visited a vineyard in Temecula Valley, CA. John & I had traveled there to help our daughter and son-in-law move into the house they were renting at the time. I told Beth I'd like to see a real grape vineyard "in person" because of John 15 and my blog. So off we went! Now in my mind I was thinking at least green and lush...after all, this was Southern California and tulips and flowering trees were blooming. But NO! What I saw was vine after vine with absolutely NOTHING on them. I could just barely see little stubs attached. Those were the branches! Oh my! Talk about instant spiritual lesson! Have you ever felt like a little stub of a branch, stripped bare? Over the course of my sixty-plus years, I have many a time. One of the times that was most painful was when we first moved to Ohio about 30 years ago. That was at a time when I didn't really know the unconditional love of my Father-God apart from my performance. I was trying to earn his love and acceptance by doing all the Christian stuff. (I was trying to earn what, in reality, I already had). My health was breaking because of strange reactions to chemicals, molds, foods, and who knows what else. Since there was little understanding in the traditional medical community at that time, I was deemed a hypochondriac who needed anti-depressants. It was then that I started into anxiety/panic attacks. My doctor put me on Xanax. It helped me sleep, but I still had the reactions and the panic attacks. First of all He said to me, "When you are afraid..." not "Shame on you for being afraid...". That was freeing because I lived with such self-condemnation because of the attacks. Then the Lord said, "Use those first inklings of panic as a signal to turn your attention to Me and trust me." So those panic attacks started to become a "place of worship" for me. Previously when I was in the car driving with my two young children in the back seat and I started into an attack, I'd make it worse by freaking out that I was going to kill my kids. After the Lord gave me my signal, I would instead focus on Him praising and trusting in my Deliverer. ("We become like what we focus on" is a spiritual principle...but that's for another blog). Little by little, as I turned to the Lord each time the panic started, deliverance came. My allergies and sensitivities continued to get worse. Some still continue to this day. But the panic is gone. I've come to know and trust my God on a deeper level than ever before. And I've come to know His unconditional love, which is a greater treasure than perfect health. I have met many women who suffer from anxiety/panic attacks. Why? Probably for each one there is a unique physical, emotional, or even spiritual reason. The one thing I know is that God can use it to deepen a woman's dependence and trust in her Father-God. It can truly be a "Key to the Kingdom." 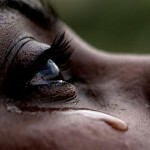 It's a precious relationship...but why is it so hard...and painful? We keep "missing" each other! Maybe we don't "get" each other? I keep trying to respect boundaries and be "circumspect" in what I say and do...and then it comes: stuff from the past, mistakes in the present...at times, I am responsible...other times, I feel like I'm damned if I do, damned if I don't. Many of you are going through difficulties of every kind...excruciating, even life threatening health problems, mental and emotional heartache, relational stresses, and the list goes on. We have no idea what the Father is doing in His sovereignty. But one thing we can count on is that He is shining us up more and more to look like His glorious Son Who indwells us. So let's embrace Him and our life and believe with all our hearts that nothing is wasted in His almighty, loving Fatherly Hands. Hebrews 12: Our Turn to Run! I was shocked just a few weeks ago when we visited a vineyard in Temecula Valley, CA. John & I had traveled there to help our daughter and son-in-law move into the house they were renting. I told Beth I'd like to see a real grape vineyard "in person" because of John 15 and this new website. So off we went! One of the times that was most painful was when we first moved to Ohio about 25 years ago. That was at a time when I didn't really know the unconditional love of my Father-God apart from my performance. I was trying to earn his love and acceptance by doing all the Christian stuff. (I was trying to earn what, in reality, I already had). Then He said, "Use those first inklings of panic as a signal to turn your attention to Me and trust me." So those panic attacks started to become a "place of worship" for me. Previously when I was in the car driving with my two young children in the back seat and I started into an attack, I'd make it worse by freaking out that I was going to kill my kids. After the Lord gave me my signal, I would instead focus on Him praising and trusting in my Deliverer. ("We become like what we focus on" is a spiritual principle...but that's for another blog). I have met many women who suffer from anxiety/panic attacks. Why? Probably for each one there is a unique physical, emotional, even spiritual reason. The one thing I know is that God can use it to deepen a woman's dependence and trust in her Father-God. It can truly be a "Key to the Kingdom."